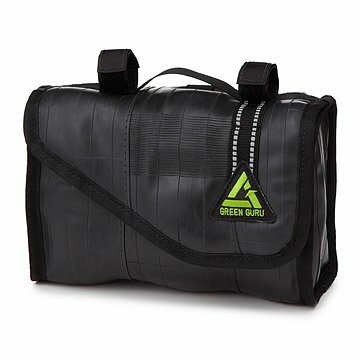 Take your lunch to-go with this durable insulated bag made from upcycled bike tire inner tubes. Cool cruising! Take your lunch to-go with this durable and earth-friendly insulated bag. Perfect for the pedal-powered commuter, it has convenient straps for hanging it from your handlebars, as well as a topside handle for handy toting. The durable, outer shell is made from upcycled bicycle tubes, and the reflective inner lining is made from recycled plastics. That insulation will help keep hot food hot, or cold food cold, or makes a convenient holder for all your bike trip gear. Made in Colorado. Wipe off with cloth or wash under water, do not put in dishwasher or dryer. Useful and perfect for everyday use. Takes weight off your backpack when you want to bring a lunch or snacks. Bought this for my dad for Father's Day. He is a recreational biker and he says this will be perfect for carrying lunch and snacks on day trips. Its a great size and fits easily on his bike. Jordan loved this gift. He is an avid biker and appreciates the extra storage this provides. My niece told me that it's a good size, nice quality, and that she'll use it often for toting her snacks. He loved it. I am now known for my unusual and thoughtful gifts, thanks to you!!! I did not see this item myself, it was a gift for my son-in-law, and it was shipped to him. I sounded like he sincerely liked it. Great Item! Love the Feel of the Innertubes! I bought this for my college-age daughter so she can bring snacks with her as she peddles around campus. Unfortunately her bike has ram's horn handle bars and the location of the brakes prevents the bag from being attached there. She loves it though, so we'll figure out something. Hadn't really thought about all the food and cleaning related issues when buying it. I gave this to my son-in-law for Christmas, and he was very happy with the gift. He hasn't had the chance to use it yet, but he and I agree that it appears to be a high-quality product.